Earning From Part-Time Business – If are looking for good earning in part-time business then this article really helps you. Today generation wants to earn lots of money from online marketing. So here we are going to describe how can we earn Rs. 5 Lacs per month in part-time business. Many network marketing company gives this chance to all individual to earn lots of money in online marketing. Online marketing is a growing industry in India, you can join any business plan to earn money in an easy and fast way. 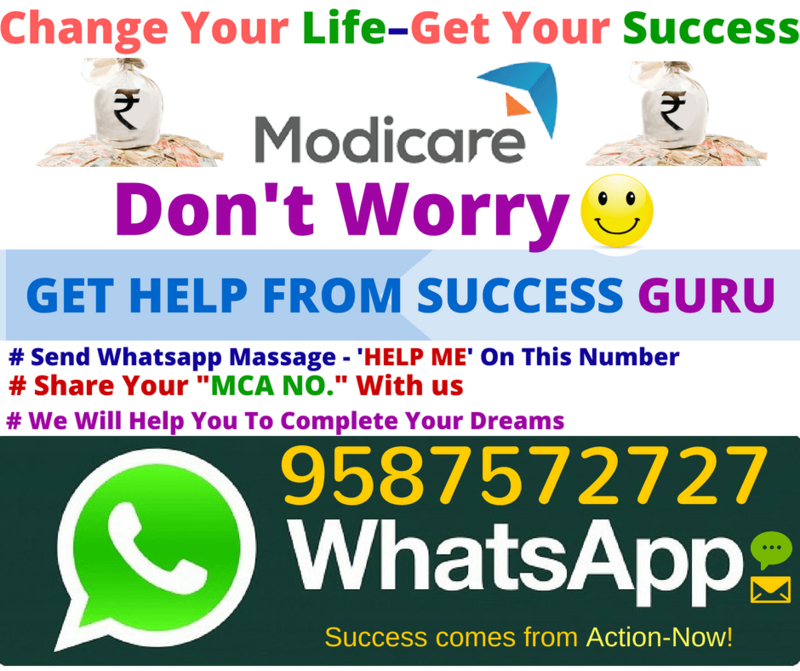 Modicare is one of the best network marketing company in India which makes many success histories. You can join the Modicare Business Plan to earn money as a part-time consultant. It is the largest direct selling company in India which has large varieties of product. Currently, Mr Samir Modi is the Vice Chairman and Managing Director of Modi Group which giving his services in Modicare Company. Mr K.K Modi launched Modicare in 1996, the first Indian direct selling company, which marked the beginning of new concepts and business ideas for the K. K. Modi Group. You can check other details about Modicare Group at modicare.com. So if you want to earn good money in part-time business then modicare is a better platform for you. You can join the Modicare business plan by becoming a Consultant which is very simple and easy process. You can register yourself with the help of modicare online portal. To online apply please click on below link. They say “if you can see it, you can achieve it”. We say “if he can see it, we can achieve it”. In 1996 I was a simple but unhappy housewife. I craved achievement and income of my own. I wished to pursue a part-time job but was discouraged by others. I awaited the right opportunity. Around this time Mr Samir Modi had been working on providing financial freedom to the common Indian. He was chasing dreams and developing methods to create success for Indians who deserved it but didn’t know how to work towards it. I crossed paths with Modicare. In a few years, we had dream cars, a posh home, and could travel internationally. The love and respect we got from our partners were unimaginable. Tragedy struck in 2005 when my beloved husband, Arun Bhargava, had a brain haemorrhage. I nursed him for six years. During this period, I realised the power of network marketing and the importance of joining a company that stands by its workers in adversity. I was earning around Rs. 5 lakhs a month then, money that saved Arun’s life and my dignity. Modicare gave me the positivity to face challenges. I received the blessings of my extended family-my business partners-who prayed for Arun day and night and told me that I can make it. Arun can’t talk or walk, but he sits in peace, knowing that his wife doesn’t have to go outside to earn a living and that he can live in luxury because he had built his Modicare business when he was able-bodied. Arun motivates me to share with everyone the importance of having a passive source of income. Given passion, life is rewarding and beautiful. God has his own plans, and he sent Samir Modi Ji as my saviour. Today I stand tall with my pride, faith, beliefs and sweetness intact because Modi Ji is standing by me. The history of Modicare is full of stories such as mine, and many have yet to be written. The Samir Modi Azadi plan to offer freedom to each and every Indian promises us a future in which our imagination is the limit. He can see it; we can achieve it. So that’s all about how can we earn Rs. 5 Lacs per month in part-time business. If you are looking for extra income in part-time business then Modicare Group gives you a better platform to achieve your target. So join modicare MLM marketing business now and start earning. 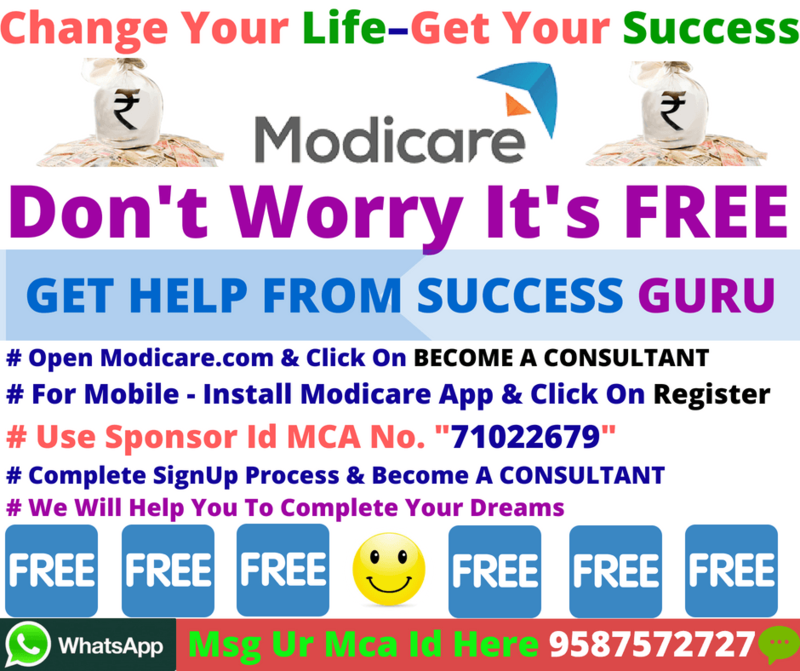 Here we provide the direct link to join the modicare business as a consultant which is a completely free process.